Enjoy beautiful sunsets from the balcony of this spacious 9th floor Summit condo. With breathtaking views, miles of sugar-white beaches, and tons of activities, you're sure to have the vacation of a lifetime. Our cozy unit includes cable TV/DVD in the living room, with a brand new sleeper sofa and chair. You also have cable TV in the bedroom. This fully stocked unit will also provide you with tons of conveniences at your fingertips such as microwave, coffee pot, dishwasher, and brand new full-sized washer/dryer. You'll also enjoy recent updates such as a new mattress and floor tile in the master bedroom and a new air conditioning unit to keep those summer days nice and cool. The Summit is very close to fabulous dining, terrific shopping, and great restaurants. You'll be within walking distance to Signal Hill Golf Club, Club LaVella, Hammerhead Fred's, Mellow Mushroom, and Spinnakers. The Summit features 2-swimming pools (1 heated), 2 kiddie pools, ample parking, poolside tiki bar, deli and ice cream shop, hot tubs (indoor & outdoor), game room, sauna, exercise room, tennis courts, jet skis & waverunners... all on site. Sorry, no pets and no smoking. Panama City Beach is changing so much from the place it was when we were young. New businesses are coming in all of the time and properties are being added and updated. 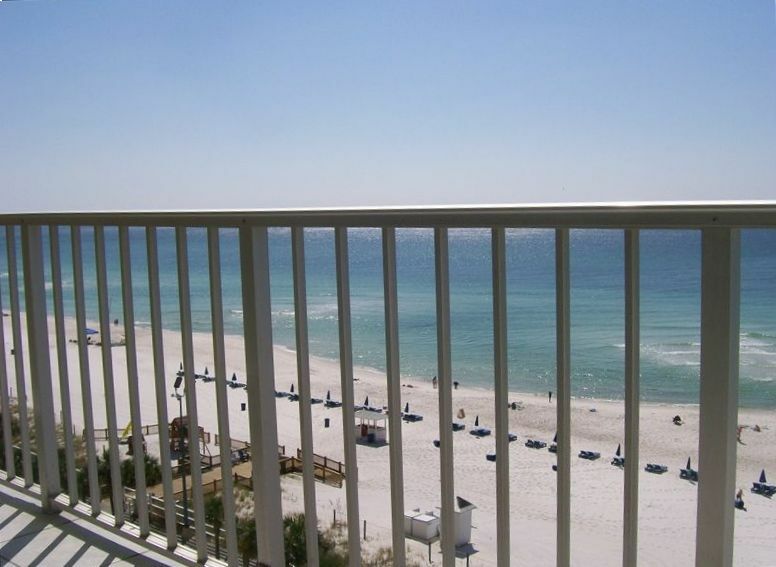 We hope you enjoy the 'new' Panama City Beach as much as we do. Aside from being right on the beach, you can literally unpack your car and never get back in it if you don't want to. Paradise Grill is on the right, so you can walk next door and have lunch on the beach. But there are many other restaurants within walking distance. The Summit Snack Bar has pizza and hot dogs; Bikini Bobs makes a great BLT and has terrific onion rings. Mellow Mushroom, Subway, Hammerhead Fred's and Wendy's are across the street. The kids can walk across the street and ride go carts, play games, or test their bravery on the slingshot. Stop by Wal-Mart on your way in--and don't go back out if you don't want to! If you do go out, try one or two of our favorite restaurants: Bayou on the Beach on Middle Beach Road, Calypso Cafe on Front Beach Road (not far from Pier Park), or The Back Porch at Pier Park. See front desk for username and password. Just got back from my 2 month stay at this condo at The Summit. Upon arrival the cleaning people were finishing up, they did a very good job, no surprises down the road. The bed was very comfortable and it had everything I needed for my 2 month stay. I had a couple calls with the owner, John, very nice man. For the price I paid this was perfect for me. I would recommend it to others for sure. It could use a few minor updates but for the price you can't beat it. Condo was very clean and had everything you need for a week at the beach! Bed was comfy and the two restrooms helped so much! The view was extraordinary and the resort had everything needed to not leave! Bikini Bobs is a hidden gem. John was so nice to deal with and we will definitely be back! Great Room, great location, had a great time. We had an excellent stay! The condo had everything we needed. The bed was so comfortable, we hated to leave it. Excellent view. Thanks John for making our vacation great! And for letting us enjoy your piece of paradise! Plenty of room for just my husband and I for the week. Pans and baking dishes weren't non stick anymore, I assume from usage, so they were hard to use and clean. Oven eyes were uneven when cooking but still worked ok. The blinds to the sliding door were missing some of the pieces to it so it made it hard to open and close them and try not to break any more. Overall the experience was a great one at The Summit and they had great amenities! The room was clean and still a good one! We will be returning in the future! John was great in responding with any messages I sent and was a great guy to work with. Cleaning staff was running behind, so was late getting into the unit and the owner John was more than apologetic. But hey, who hasn't had one of those days! I truly enjoyed my stay and appreciated him letting me stay in his home away from home. Hope to get to go again one day.